Here are some of the award winning homes we have built, which have been professionally photographed, and featured in several magazines. Click on each home to see an example of our work. A traditional Texas outside and a cathedral inside make this a most unusual and beautiful home. Hill Country stone and timber frame made of Red Oak with a western flair. 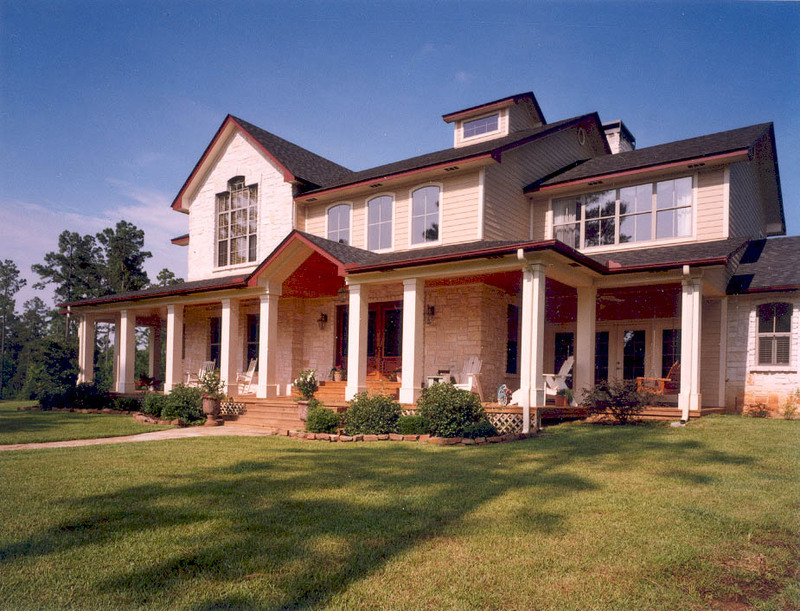 A traditional elevated Texas farm house style with surround porches and a beautiful recycled Douglas Fir timber frame. A Craftsman Style home built from reclaimed Douglas Fir, with surround porches. Features the exceptional use of recycled materials and a timber frame car barn made from kiln dried Southern Yellow Pine. Built to withstand a Colorado winter, this home features a Southern Yellow Pine timber frame with plenty of open spaces. A traditional Southern Yellow Pine timber frame home for an active family and one of our most popular designs. A Southwestern design that would be at home in Santa Fe as well as the Texas Hill Country. This home near Nacogdoches follows what has become a familiar pattern for us. The main public areas of the home feature a timber frame while the balance of the house is conventionally framed. This home will be featured in an upcoming issue of Timber Homes Illustrated. Public & Commercial BuildingsHere are some of the public and commercial projects we have done. Of particular interest are the many pavilions. A rustic summer camp with an open dining hall and comfortable surroundings. Places to relax and enjoy the marvelous natural spaces that make up the Woodlands. A new chapel with a design reminiscent of old England, featuring and expansive interior and a high arched ceiling. The frame was done in Southern Yellow Pine and was stained a rich walnut color. Very large files and extensive pictures and text will require long downloads. But there is a lot to see! Projects You can follow the actual construction of several projects in this section. 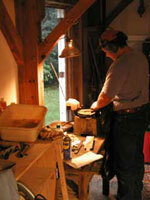 There are extensive pictures and text that show and explain how we do the work. Please allow plenty of time for the images to load. This Red Oak timber frame was built near 8,500 foot elevation overlooking the San Juan and Rio Grande national forest to the north. It is a beautiful execution of traditional timber frame design in a spectacular setting. Very large files and extensive pictures and text! 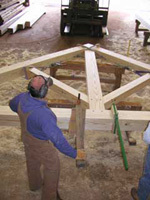 A king post truss system made from Southern Yellow Pine, giving a conventional home the feeling of a timber frame. Smaller size files and faster downloads. A stunning home built high above the Perdenales River north of Johnson City, Texas. This home features the use of laminated arches and Southern Yellow Pine. A moderate number of pictures and text. 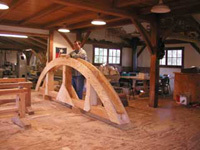 Building a traditional timber frame of Southern Yellow Pine. Our smallest project file with smaller pictures and less text. Faster downloads.